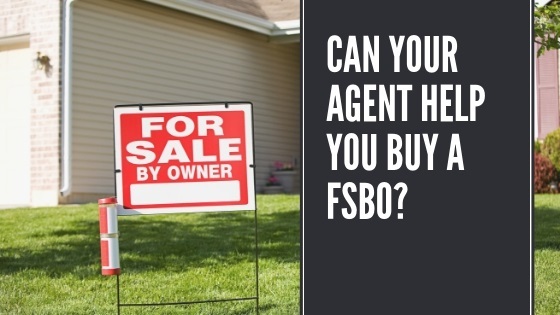 FBSO, or for sale by owner, is a property that is not listed with a brokerage or real estate company or agent. A lot of people try to sell a home themselves and if it doesn't sell, then enlist the help of a real estate agent and while not everyone does it that way, some never list with an agent but, they may entice a buyer that's working with their own representation. You see, in the real estate world, there are usually two agents involved in most transactions, the listing agent and the buyer's agent. The listing agent lists the property and markets it for the homeowner or seller the buyer's agent brings in a buyer and represents the buyer on their behalf. This ensures fiduciary duty and due diligence on both parties and confidentiality as well. But, when the seller also acts as their own agent, there's not another agent involved and they may not even want to deal with a buyers agent. This can be a tricky situation but because we've done this for years we know how to navigate it and communicate with just about any homeowner or seller. Even if you are working with a buyers agent and you find a house that you love but are unfamiliar with the real estate transaction process and want to use the agent to facilitate the deal, your agent can negotiate with the seller. Here's how something like this would go. I've shown my buyers several potential homes in the area listed under the MLS or with a brokerage but they help define one in the local newspaper listed and marketed by the owner. They called me up to find out what I could do to help them with the showing and the negotiation process. So, I called the homeowner directly and told them I was working with the buyer that found their home interesting and that they'd like to see it. I ask if the seller is open to working with the buyer's agent. Often times, they will say no because that's why they've chosen to sell the home themselves, to avoid any real estate commission fees. But, in many cases, we can actually increase the price of the home as long as it will appraise for an inflated price, and then use that extra money as the buyer's agent commission. Most homeowners are more than willing to go this route. Then, the buyer is protected and I can help facilitate the entire transaction from offer and acceptance to appraisal and home inspection. Now, if the home will not appraise for the inflated price then we have to go back to the drawing board for a little bit of negotiation. Some homeowners feel that their home is worth the inflated price and will simply reject the offer. If this is the case, often times I will tell the buyer to let the property go, because more than likely, another buyer will also find the home and when the appraisal comes in lower than listed, the owner will have the same issue as before. They can either choose to list the property at the appropriate market value or find a buyer willing to pay cash for the inflated price. Sure, I've talked to many homeowners that complete the test real estate agents but it's probably because they worked with some shady characters in the past. I'm usually willing to give them a discount on the commission if we can inflate the price to cover it. I'm also happy to act as their agent, reviewing the offer and any documents and addendum's therein. So, while it's perfectly fine to buy a home that is for sale by owner, the negotiating strategies on your buyer's agent part does matter. Experience and understanding how to handle homeowners and sellers acting as their own agent does take a little bit of finesse. For more answers to your real estate questions feel free to contact me at any time or browse my most popular real estate questions on my video blog over at theDonPaynegroup.com.